Steeped in history dating back to William the Conqueror, The Forest Conqueror promises to be packed with wildlife and scenic views over the national park. You are sure to have a spectacular day. 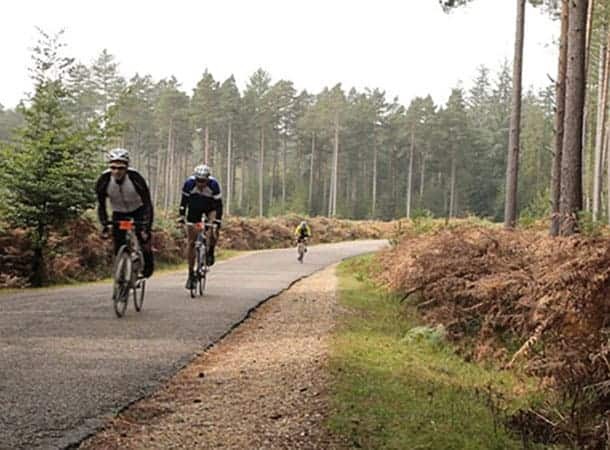 In its very first year, this sportive takes you out in the height of summer to conquer the wonders of the New Forest. Starting from Gang Warily on the south eastern fringes of the New Forest we will first head south to do a quick loop along the coast via Calshot, Lepe, and Exbury, passing through the gorgeous Lepe Country Park along the way. We then push west to the beautiful village of Beaulieu, home of the Montagues. This is where the Short route riders will take on the climb to Hatchet Pond then along to Brockenhurst to rejoin the rest of the pack. Epic and Standard riders head north west to Lyndhurst, passing the quaint forest railway station at Beaulieu road. After a quick glance at the bustling town, we’ll push on up to Ashurst before tracking along the eastern edge of the forest. At this point, the Standard riders will carry on south towards Bolderwood, while Epic riders continue their journey north for a loop that winds its way in and out of the most northerly border of the forest. Heading south, the riders regroup just before passing under the A31, striking a definite course south towards the focal point of the ride – a spectacular stint through Ornamental Drive. It is here you will see the best the forest has to offer. Upon reaching Brockenhurst, we will continue to ride south ‘till we reach the border of the forest, before setting our course for home. Our final stretch will take in the wonderful port towns of Lymington and Bucklers Hard. At the finish, you are greeted with a warm welcome, medal and finishers t-shirt.